Has the decal panel of one of your machines lost some text? 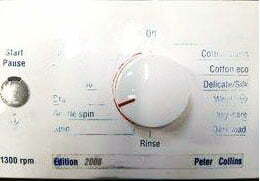 The decal panel on your laundry appliances has instructions about what cycles to use and buttons to press to change cycles as needed. Some decal panels have lost some of the text, which causes confusion when setting the cycles. If there is no text, then where do we point the control panel or which buttons do we press? You may ask why has the text disappeared? Is it the poor quality of the decal panel? Well that may have something to do with it, but the reason for this is down to fabric stain removing chemicals. Sprays that we use to apply to our garments are sometimes applied quite closely to the appliance. We may spray a shirt that has food stains on it and the overspray settles on the control panel. The tip here is to apply the stain release sprays well away from the washer or dryer. The chemicals in the stain removing spray has been found to dissolve the letters on the decal or control panels.